Our first trip out since our maiden voyage from Florida. 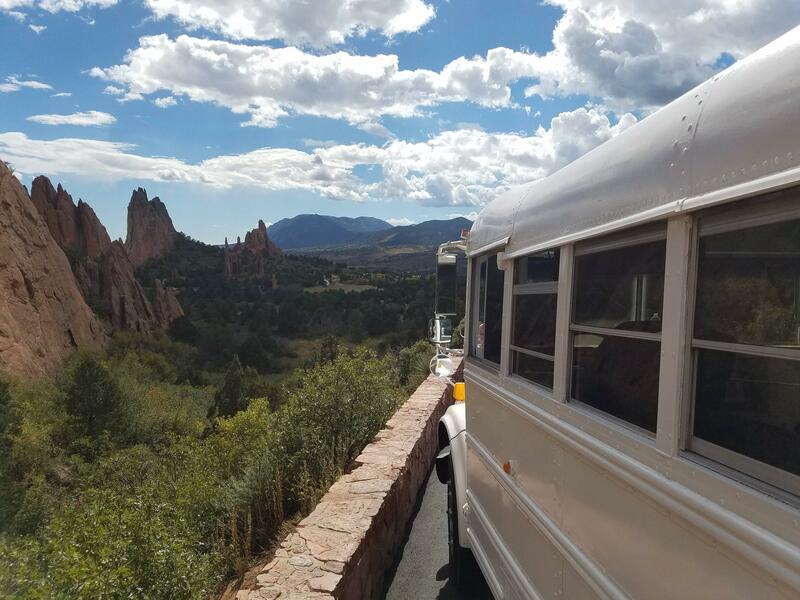 I got to enjoy the hot springs and take some pictures at the Garden of the Gods. 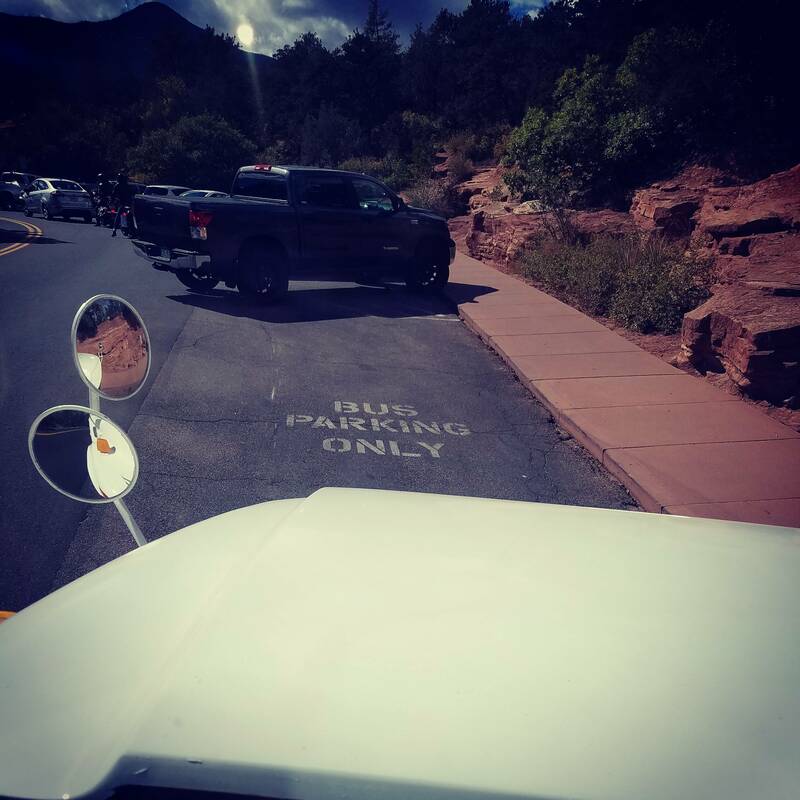 I was so excited, but the incline was too great for the parking brake. I noticed before getting out and just kept moving along. I'll look into that soon. At home, we got a chance to play with lights and brainstorm license plate ideas. I have until the middle of October to decide. I have gravel down in the backyard and I am ready to start remodeling the inside. The control panel went wild at the beginning of the trip, I tapped on it and everything went back to normal. I am starting to grow my list of things to look into and work on.. I totally dig LED lights!! do cool stuff with them!! I have done lots with them at my house and apartment... i love your fun ideas!! on my new bus the panel freezes up until i reach behind and press gently on the connectors then it works for a few hours again.. so I need to do the same to that one..
your parking brake.. im assuming you have hydraulic brakes... if so is it a lever on the floor or the dash? there may be a ball on the end of that lever that rotates.. this is to tighten up the parking brake.. that ball can rotate loose on its own sometimes.. I do mean the dash gauges. The light to illuminate them has a mind of its own as well. I will do some investigating and soldering. The parking brake is a lever on the left that goes down to the floor. I will definitely try that next time. Thank you!! 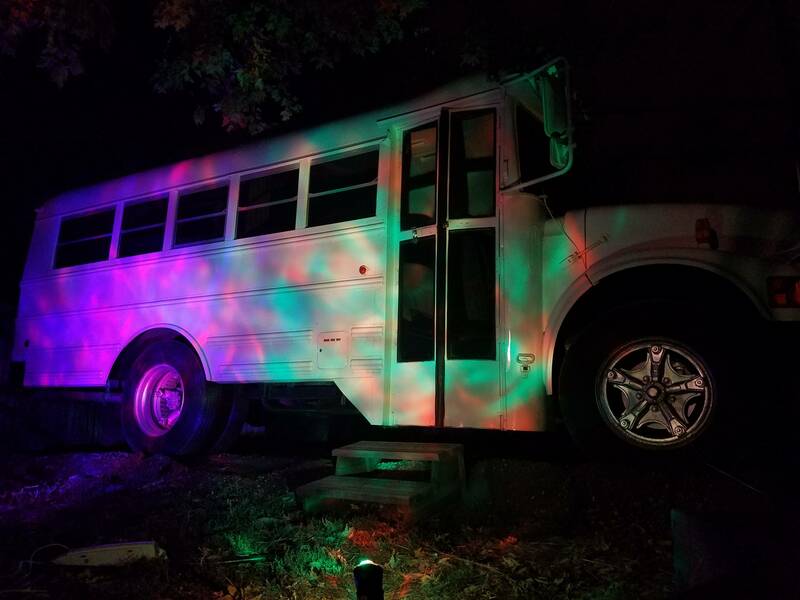 The LED's are halloween lights from walmart, but I really enjoy them on the white bus I'll be figuring out a way to put LED's on the inside, the 50/50 strips probably. Id like to install some el wire in places to but that will come with time. I have an idea of getting PPLEATR as a license plate but I dont want to be stuck to the color purple. I have a few more names listed as ideas. Who knows what the DMV will have available, Colorado doesnt allow to check.